Yesterday I gave a guest lecture to Environmental Planning at the University of Waikato on inter-regional planning and sustainability. My thanks to Professor Iain White for the opportunity to guest lecture. 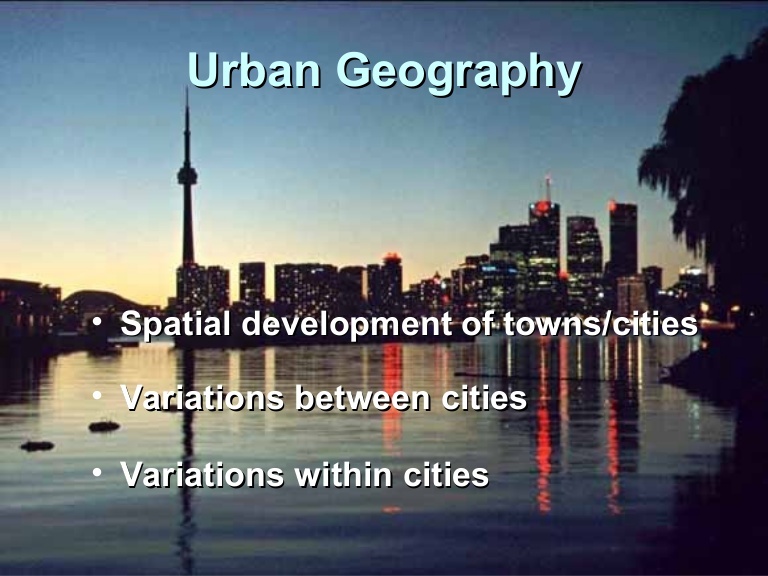 The lecture built upon a blog post I did recently on inter-regional planning. You can see the full post at the bottom of this post. 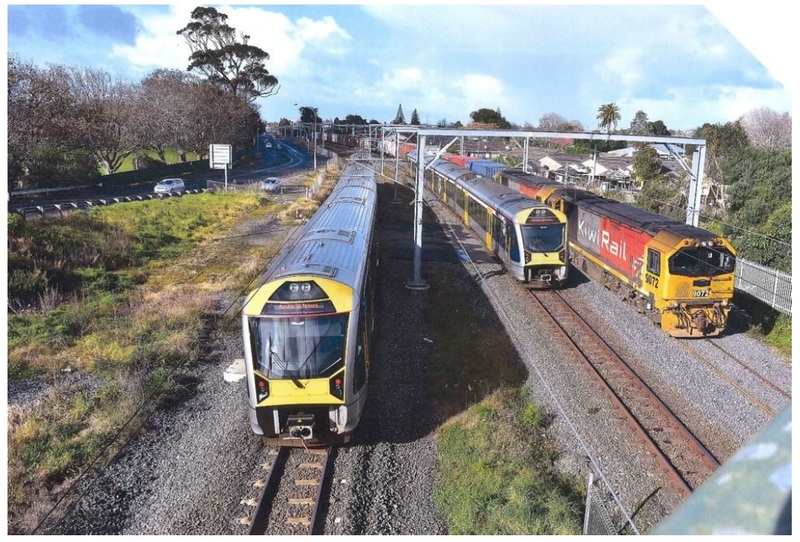 Greater Auckland’s Regional Rapid Rail has certainly opened the discussion on rebuilding the regional rail network across the upper North Island. It should also be noted the car travel times will get longer as population and traffic increases on the Southern Motorway and Waikato Expressway. I am not here to go over Greater Auckland’s time and dollar figures as they have done that extensively over at their place. Here I am going to look at the Urban Geography of the Regional Rapid Rail and how it promotes connectivity across the upper North Island. As Auckland continues to boom satellite towns like Pokeno, Huntly and Morrinsville will reestablish themselves especially as the other major centres (Hamilton and Tauranga) continue to become major satellites to Auckland. 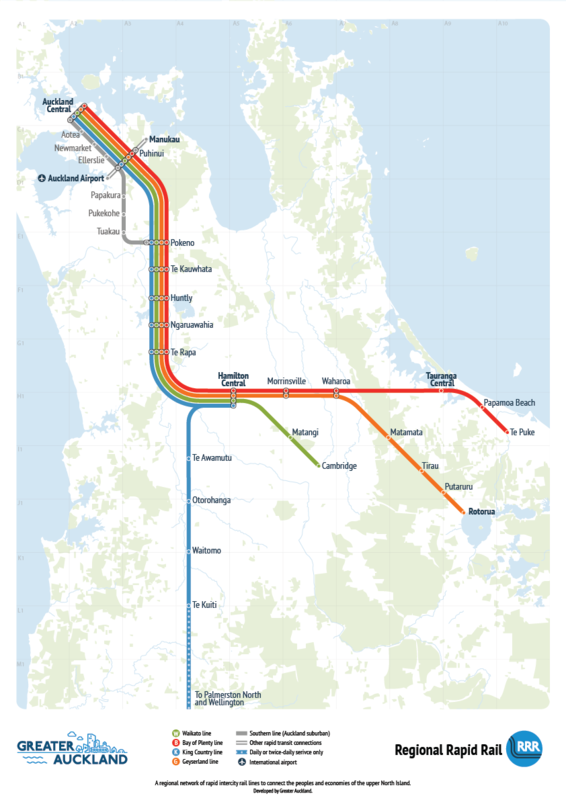 The good thing is those places are on both established road and rail links making their connectivity back to Auckland rather straight forward. Cue the Regional Rapid Rail concept linking the smaller and larger satellites back up to Auckland. Rapid urbanisation has seen provincial centres without decent industry hollow out while the main urban centres continue boom and expand. This is not healthy for either and can create imbalances both economic and social that impair the economy. Whether industry moves to the provincial centres or not population load spreading (that is Auckland loses some of it population to its Satellites in the south) can act as a control rod to the reactors that are our major urban centres. As noted it above Auckland to Hamilton would be 70 minutes so being in a provincial satellite between Pokeno to Te Rapa connected to the Regional Rapid Rail allows for some Aucklanders to move while still having good connectivity with their employment back in the City. If Manukau City Centre and its big industrial complexes step up then a commute from Huntly to Puhinui or Manukau becomes even shorter. 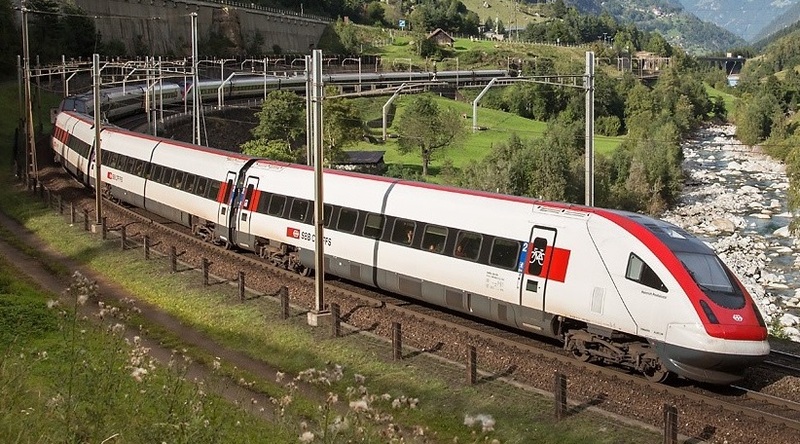 If a smaller satellite is not for you then Hamilton or even Tauranga is always available for you to live while being connected back to Auckland via the rail system. So yes Regional Rapid Rail connecting up both the main urban centres and the provincial satellites can give pressure relief to Auckland through population spreading. Like with population rapid urbanisation consolidated heavy industry away from small towns and into the big urban centres gutting those smaller towns. Projects like the Waikato Expressway will bypass and further harm these towns (like Huntly) so enter rail to turn things around. Assist the creation of affordable housing supply that is well-connected by congestion-free transit. Use transit focused residential development to catalyse the local economies of northern Waikato towns, which face potential economic decline by being bypassed by the new Waikato Expressway. Niche industries can include tourism which is next up. Two hours to Tauranga by train. I will certainly take that on a Friday evening returning to Auckland late Sunday or early Monday when taking a weekend away from Auckland compared to the two and a half hour drive by car I will have to do next month by car. Play the cards right and you could have a premium service going down on Friday and returning Sunday that serves food and well booze for a slightly higher fare. This would tap into the large tourism potential Tauranga offers but the smaller Centres connected by Regional Rapid Rail need not miss out. Rotorua, Cambridge, Waitomo and even Huntly should be able to tap into niche tourism offerings of various sizes that the rail system would allow. Again diversifying your employment base gives you as a smaller centre better protections from the swings of the economy. Productivity and environmental impacts – transforming and unlocking places! Heavy Rail is the most efficient form of moving people and goods over long distances compared to road travel. Whether it be lower emissions, able to do work on your laptop, relax on the trip or simply beat congestion on the Southern Motorway productivity and (lesser) environmental impacts are winners from Regional Rapid Rail. Of course lowering the road toll (which costs the economy dearly) is another outcome of providing rail alternatives whether freight or passenger. A rail corridor also has less environmental severance than a four lane highway does as well as less scaring. So not only does rail promote productivity and encourage lower emissions while travelling, rail also is less visually destructive to the rural environment than a four lane highway. But the impact that might not be realised as quickly is the transformation and unlocking of potential for the Centres connected to Regional Rapid Rail network. Linking regional transportation to well-planned communities with good urban outcomes. This should not just be a rapid train network but the means to create vibrant, livable towns and cities that are economically and socially sustainable. Vibrant places are productive and environmentally positive places. Auckland International Airport is the gateway to the world in terms of air travel. Currently the only way to get there is to drive or catch a regional link flight which are not cheap at the best of days. Enter The Southern Airport Line and Puhinui Station. The Southern Airport Line is a rapid transit link (most likely light rail) from Manukau to the Airport via Puhinui Station that connects up with both the commuter rail/bus services and the Regional Rapid Rail lines. This means you could catch a train from the Waikato or Tauranga up to Puhinui Station, transfer to the Southern Airport Line at Puhinui and continue on a second train to the Airport without the hassle of driving or arranging van shuttles (subsequently risking fouling of any of the State Highways on the way to the Airport). Like wise you or tourists can do the same in return by catching the Southern Airport Line to Puhinui then catching a regional rail service down to your destination without having to worry about shuttle vans and rentals (until you get to your destination if so inclined). A good option especially if coming off a long flight. Of course this would mean Puhinui Station would need to double in size to four platforms while both the Third and Fourth Mains would also need to be built to facilitate the high volume of freight and passenger traffic in the area. The good news is The Southern Airport Line is already committed to and should be open by 2020. The Third Main from Westfield to Papakura is also committed to while the Fourth Main from Otahuhu to Wiri is being lobbied on to make it happen. Regional Rapid Rail and The Southern Airport Line: seamless travel to and from the Airport no matter where you are in the upper North Island. Now let me get this perfectly clear: the main City Centre has its place and will be the nexus of commercial and civic activity for both Auckland and New Zealand. That said it does not dismiss the role of a smaller and secondary City Centre surrounded by industrial complexes in filling a need for the Waikato and Bay of Plenty. 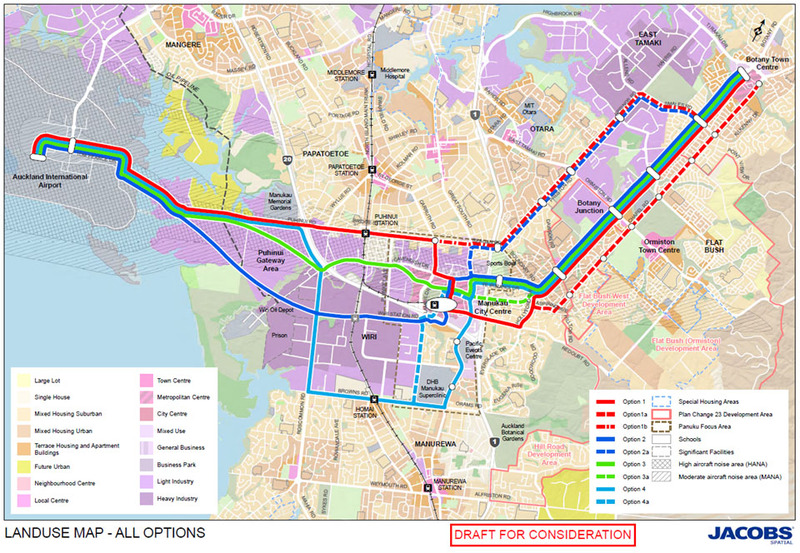 Note the Golden Triangle mentioned with Manukau acting as the key gateway. As you can see Manukau does act as a gateway to the Waikato and Bay of Plenty. 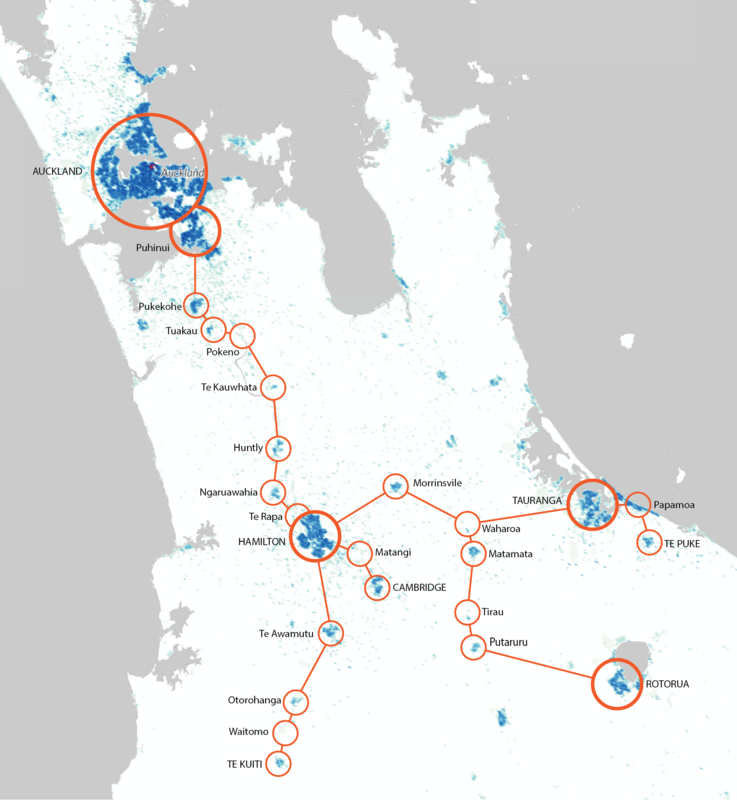 Regional Rapid Rail, and the Southern Airport Line (both to the Airport and Manukau) connect the Waikato and Bay of Plenty to both major employment and population centres. If the main City Centre is not for you or you need an industrial base Manukau and Southern Auckland has probably what you are looking for. Effectively Manukau becomes the core to both Southern Auckland and the those in reach of the Regional Rapid Rail. Normally the Ministry of Transport would oversea the execution of the Regional Rapid Rail program and the Southern Airport Line program. However, given the consequences to the urban environment brought on by those urban centres connected to the RRR the Ministry of Transport is not best set up to handle the mechanics of both programs. The Planning Ministry borrows its concepts from New South Wales. We exist to make people’s lives better by making NSW a great place to live and work. We help to provide homes and services, build great communities, create jobs and protect the environment. The Department engages place making which includes transport and the same principle would be applied here with a Planning Ministry. That is the Planning Ministry would draw up the overall inter-regional planning framework and be the overseer to all other agencies executing the planning framework including Regional Rapid Rail, and The Southern Airport Line. The Planning Ministry would be your one stop shop for transport urban and economic planning, environment management, and plan/place maker. The Planning Ministry would break down silos that would have otherwise occurred between the Ministry of Transport and the wide range of Councils involved with the Regional Rapid Rail Scheme. In conclusion and some 3,000 words later the Urban Geography of Regional Rapid Rail is just more than pretty lines on a map and trains going between Auckland and somewhere south of the Bombays. Whether it is for tourism, diversifying employment bases in provincial centres or allowing population loads to spread from Auckland south Regional Rapid Rail presents those opportunities more than four lane highways ever could. That said to make sure it is done right a Planning Ministry would be needed to oversee the multi-discipline approach that not only delivers transport links but also economic and placing making as well. It is all about tapping into the potential of the urban centres both Auckland and those in the Waikato and Bay of Plenty.